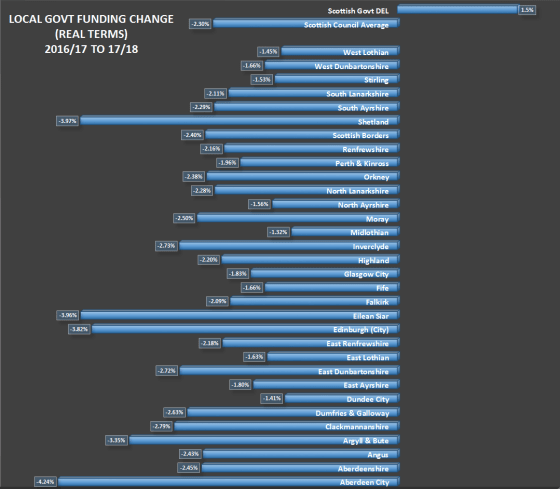 The table below shows the changes to each council’s resource grant from the Scottish Government, the like-for-like change to council funding from the 2016/17 budget¹. Every council is facing cuts. 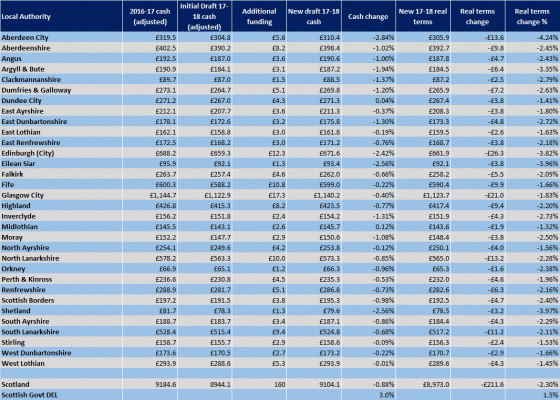 The average fall in centrally provided resource funding across Scotland is 2.6%. And before the inevitable objections, no, this is not in the face of Westminster cuts to Scotland’s block grant. Departmental Expenditure Limits (DEL) available to the Scottish Government has increased this year – by 1.5% in real terms². The Scottish Government, as is their right, have simply decided that they would rather spend the increased funding elsewhere. They have, it seems, other priorities. But whilst doing so, the First Minister has declared herself “delighted” to force a 2.1% real terms cut on her constituents’ council; “delighted” to force cuts on local services upon which her constituents rely; “delighted” that such cuts might result in job losses for her constituents. ¹ Data is taken from the Scottish Parliament Local Government and Communities Committee Agenda and meeting papers for 21st December 2016; and the Scottish Government’s news page ‘Budget boost for economy and public services’. I have used the same deflator as the committee paper to transfer the cash figures into real terms. Note these are *resource budgets* only, i.e. the funds that are available for services. ² See the Scottish Parliament Information Centre report on the initial draft budget and latest brief or the draft budget itself (if you can work round the spin). For help seeing the actual data without spin, see here, here and here from the always excellent chokkablog. Born in the North east of Scotland, studied Law and then History at Aberdeen University and, following a period travelling, returned to the north east to work in the oil and gas industry. While I appreciate that in real terms there will still be cuts and the £160 million may not mitigate these, where are the actual cuts coming from? Not the Scottish Government but Westminster who continue with their austerity policies and cuts to Scotland’s block funding. The fact that Wastemonster have the audacity not to allow Scotland to spend the £60 billion it earns and limits us to the £37 billion Wastemonster chooses to send back to Holyrood is diabolical. In addition, how many cuts are the local councillors themselves experiencing from their inflated salaries and expenses. Many have other well paid jobs or big pensions. How about people who don’t have work or other incomes getting the opportunity to stand for election instead of the old boys network? There are also too many wasteful council projects where money could be better spent on frontline services like cancelled waste incineration plants etc. A much more complex problem than SNPBAD I suggest? ?